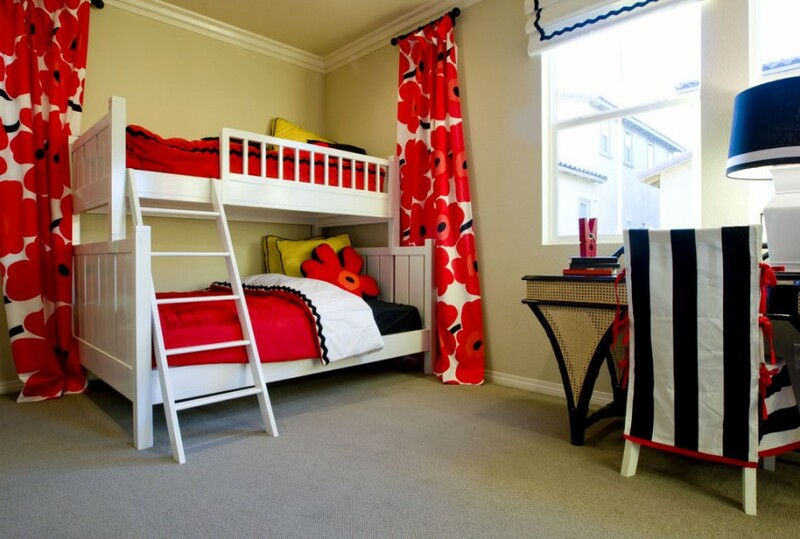 Bunk beds for children are often placed close together. 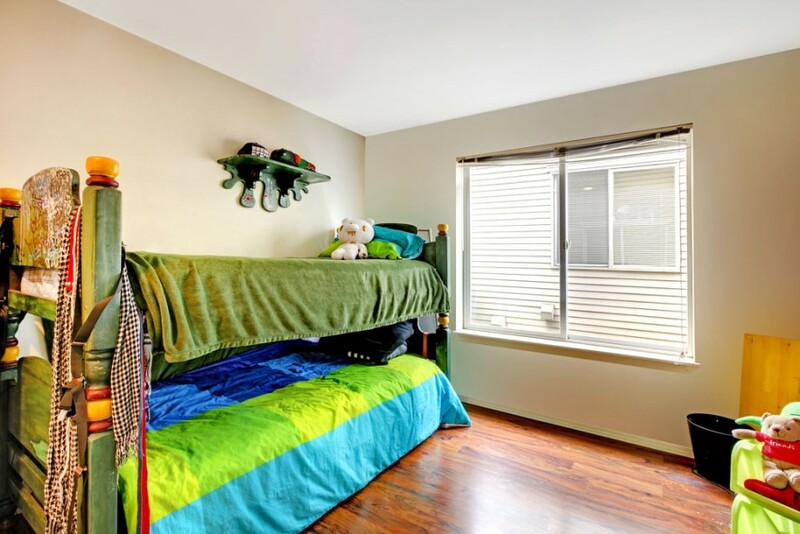 This bed allows more height between the beds so an adult is less likely to hit their head when sitting up in the bed. 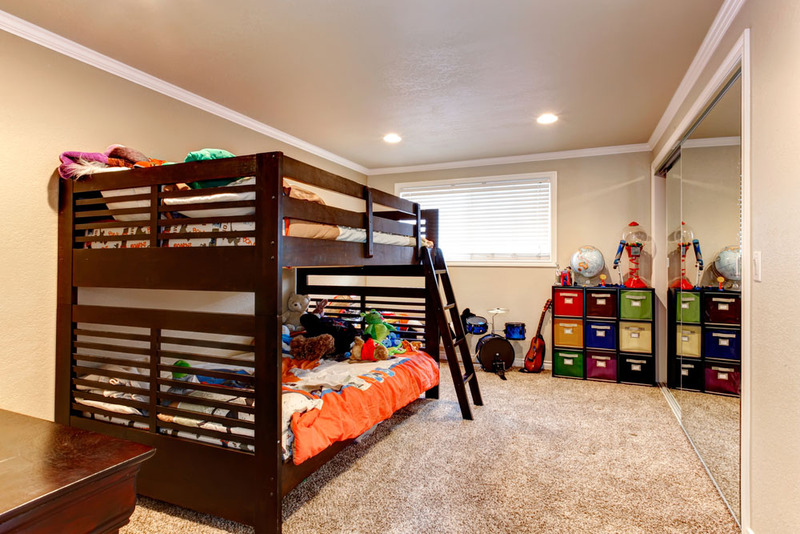 Bunk beds are a great place for two children to sleep, but if there is only one child in the room, they are also a great place to store animals and for guests on occasion. Most bunk best have simple ladders. This bed uses the space in a more unique manner. The steps leading to the top bunk double as storage drawers. 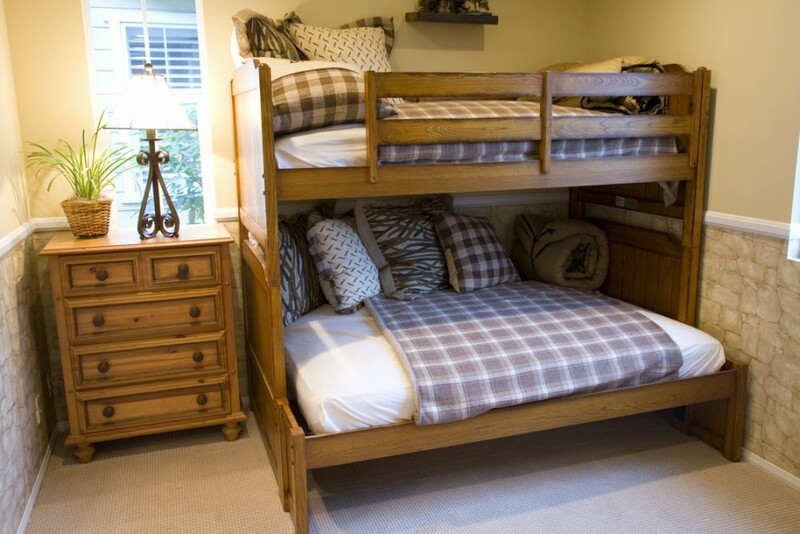 Not all bunk beds are identical in size from top to bottom. 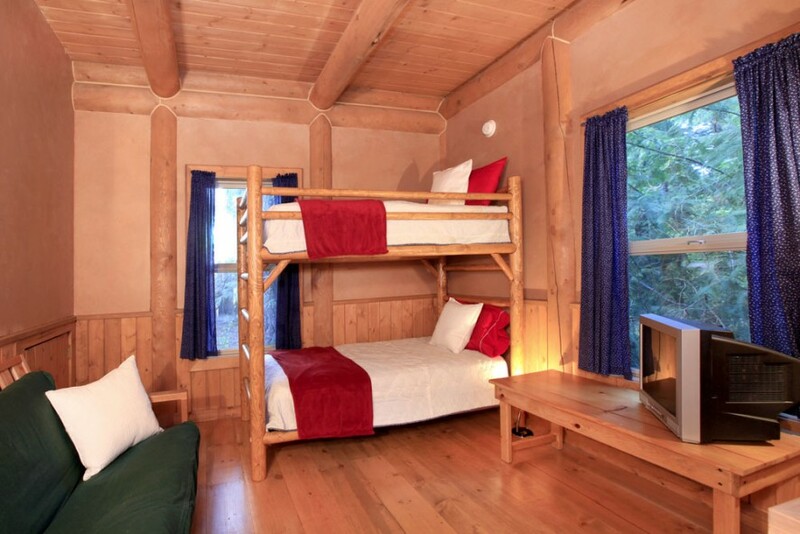 The larger bed on the bottom could sleep two adults while the child could sleep on the top bunk. 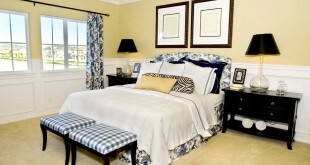 A whole family could sleep in this room together with ease. Adding a smaller top bunk allows more head room for the people sleeping on the bottom and frees up extra floor space in the room. This chunky wooden bunk bed has added style and personality. Forget about normal wood colors, the bed brings plenty to the room. 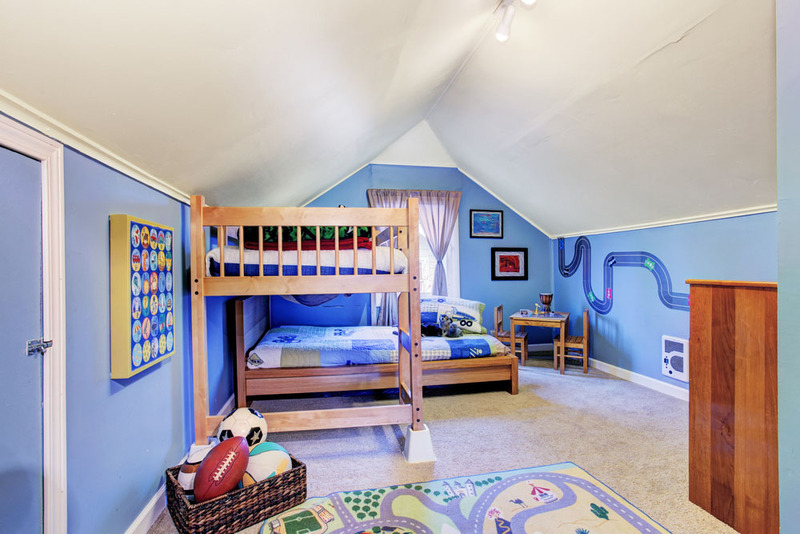 This example sits at a right angle and allows more space underneath the upper bunk for play and storage. 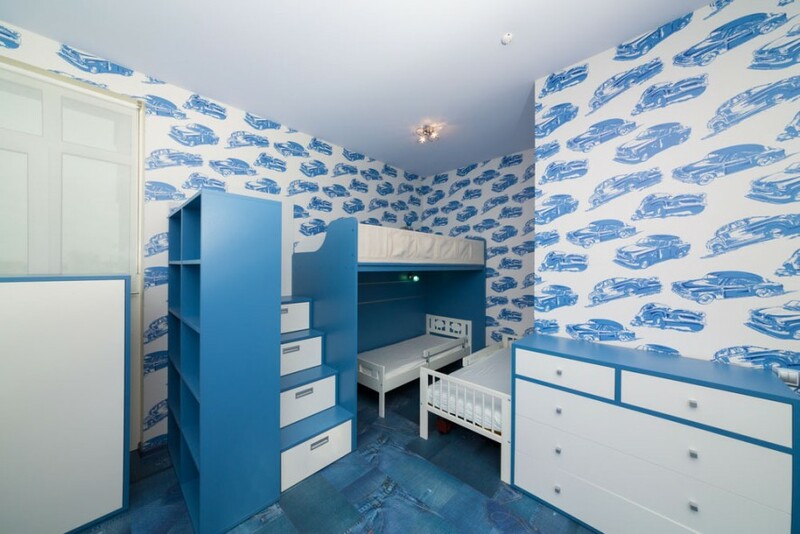 There would not be enough space in this room for two beds and all the dressers. 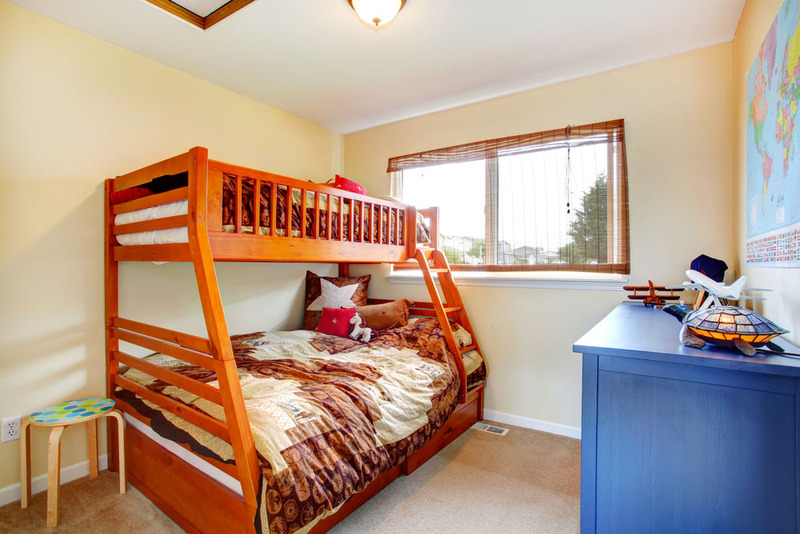 The bunk beds alleviate all space issues in this room. 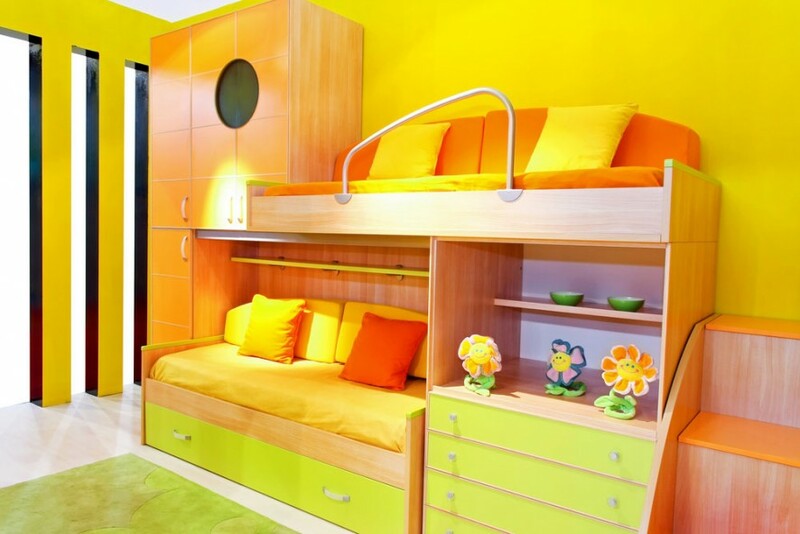 White bunk beds can easily be dressed up to meet the occupant’s style with vivid colors. 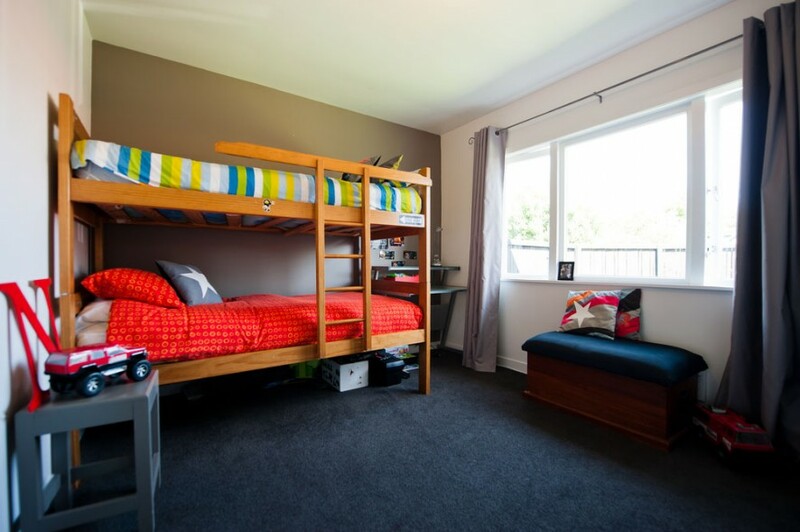 This example almost doesn’t look like a bunk bed at all at first glance, but rather a tiered seating area. The bottom bunk makes a great couch when it is not needed for sleeping and the added storage space is always nice. The steel look is also easy to style around since the metal color goes with anything placed around it.  The material is also long lasting and easy to maintain, even after years of heavy use by a child. 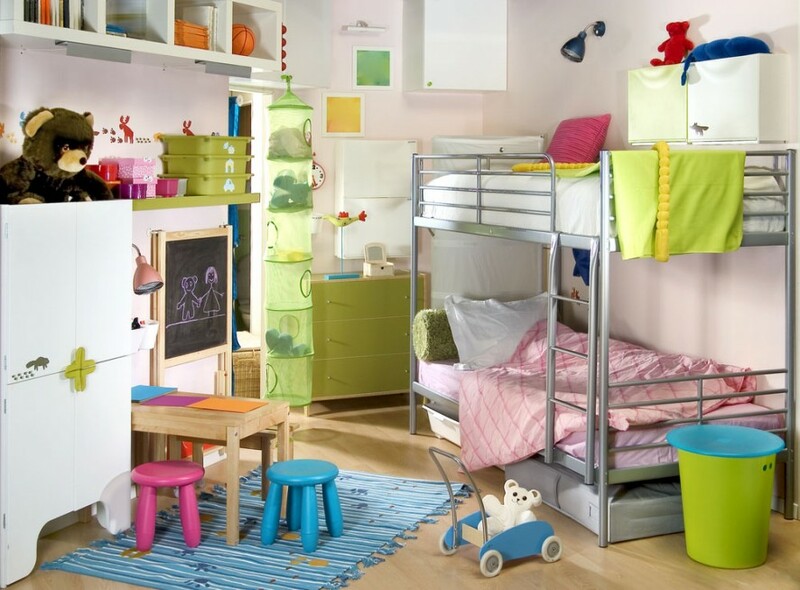 Simple bunk beds fit in well when there are a lot of other style elements going on in the room. The bed itself can serve its purpose and stay out of the overall design. This elegant bed fits into the room with ease by using the same natural looking logs that appear in the rest of the room. Even small spaces can accommodate quite a few guests when bunk beds are present. This adult design has a classic feel to it that will not get old as time goes by. 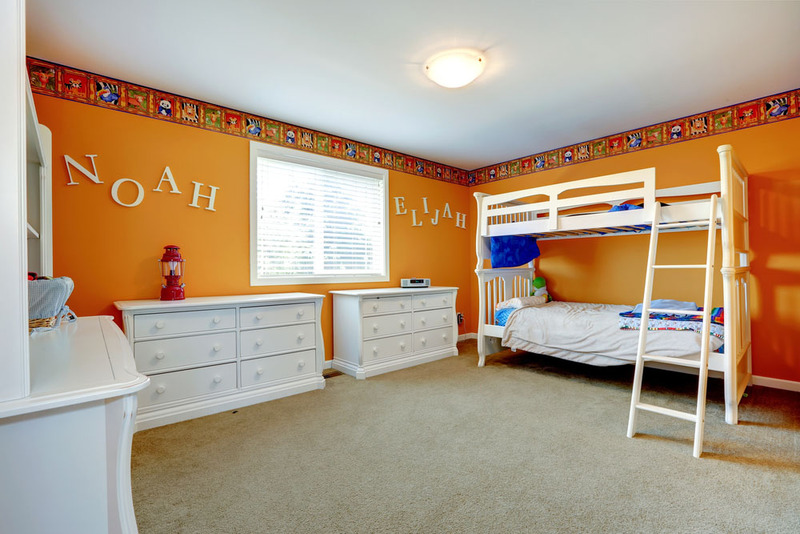 Many bunk beds have the same style from top to bottom, but this example shows that if one child has different tastes than the other, the beds are free to reflect those styles.